The Ponte Vecchio looked like a post card. Sevilla, Spain will always fill the biggest space in my heart. But Florence came close to giving Sevilla a run for its money. Our time there was pitifully short, giving us only a taste of what the amazing city has to offer. But what a we did taste was so good, I think everyone on the tour will be going back for seconds. (Hehehe excuse my cheesey metaphor). We had another long drive from our campsite in Antes to Florence. The coach drove along the coast, allowing up to glimpse the amazing views Riviera as we made our way into Italy. We made a rest stop not long after entering the country, during which I bought my first slice of Italian pizza. Oh my gosh it was so good. Even for a rest stop. Then, we continued onward to our campsite in Florence. It was perched up on a hill with an amazing view of the city through a heap of branches. We had some time to set up camp and eat dinner, but soon we headed back out to the city. One thing our tour guide was skilled at doing was downplaying the amazingness of the places we went on the trip. She told us we’d be spending some time that night at a karaoke bar in Florence. But what she didn’t say was that it was one of the most extravagant karaoke bars any of us would go to, or that they had 20 euro pitchers of cocktails, or that the place turned into a nightclub at night. Soon enough the night got a bit crazy. I think my favorite part was getting up on stage and shamelessly singing “Rolling in the Deep” by Adele to a crowd of tourists and Italians who I will hopefully never see again in my life. We stayed up into the late hours of the night (well, the early hours of the morning) and eventually caught cabs back to the campsite, though not before stopping for some late-night pizza. The next morning came too soon and we sluggishly ate breakfast and got ready to go back into the city. I was feeling a little out of it after the long night we’d had, but I powered through as we embarked on a guided walking tour with a local Florentine guide. The city was bright and beautiful. We walked by the Duomo and other major buildings, stopping by the location from where the statue of David was removed. The Duomo was so big, it was actually hard to see all of it from the ground. 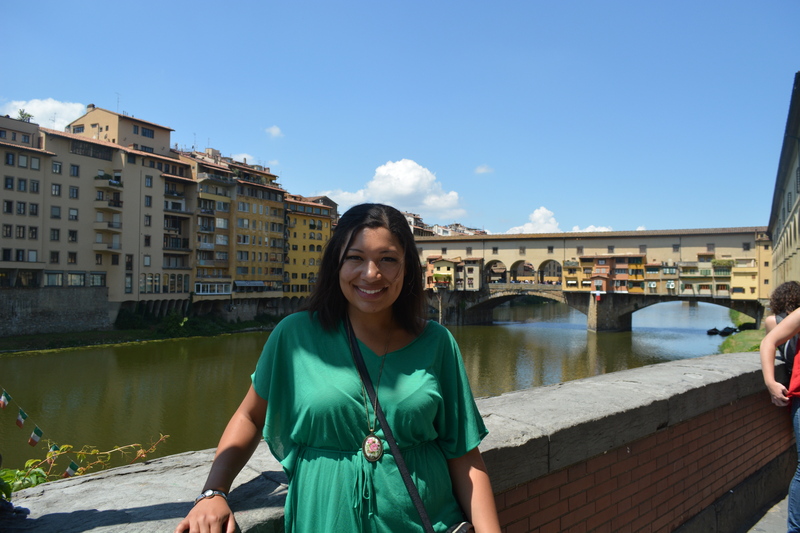 The Ponte Vecchio was just as beautiful as it was in pictures. The impressive bridge looks like a city on its own from the distance, and feels like a market on the interior. Though I was feeling sickly, I was still frustrated with the speed at which we went through the bridge. I had no time to stop and really take in what I was seeing because I was too worried about trying to keep up with the group and hear what the tour guide was saying. 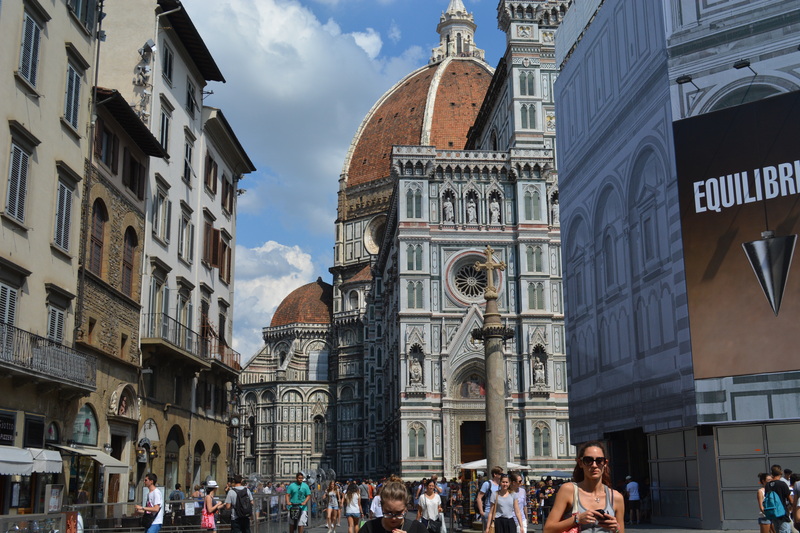 I will definitely need to go back to Florence to experience this amazing city again. The tour dropped up off in the center of town, then we had a few hours to explore on our own. I broke off with a couple of friends and headed to a pizzeria (surprise, surprise) for lunch. I had an amazing white pizza, though I had to custom order it because the waiter seemed to think the idea of a sauce-less pizza was crazy. I washed it down with a cup of coffee, and then we paid our tab and went back to exploring. 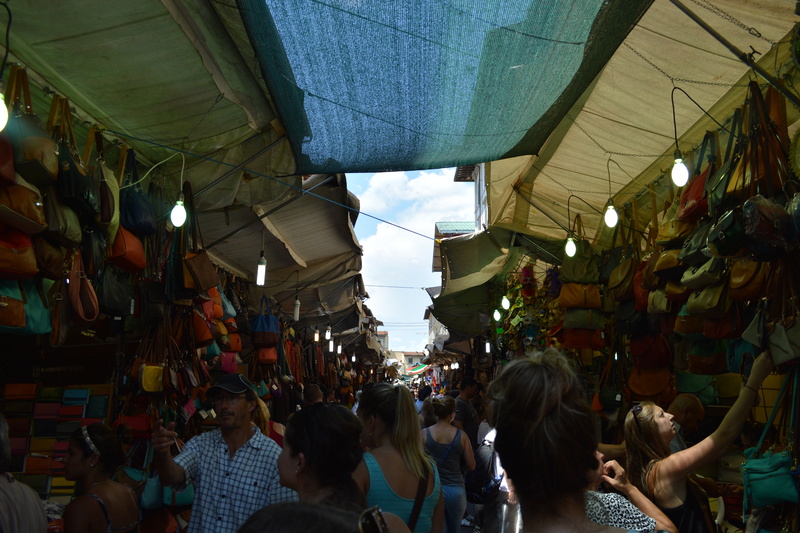 We did not get far because right next to the pizzeria was a street market that stretched for at least a kilometer and broke off into a few side streets. We spent nearly our entire day there, grazing through the fake leather bags, statue of David magnets, glass earrings and Italian shoes. Every little stand sold practically identical items, yet we went stand to stand, expecting to find new treasures along the way. After a few hours, I managed to get some souvenir shopping done and my friends found some great buys, and we made our way back to the meeting spot where we were to catch up with the rest of the group. Along the way, we stopped for all of our very first gelatos. And let me just say, MMMMMMmmmmmmmmmmmmmmmmmm. Holy crap it was so good. 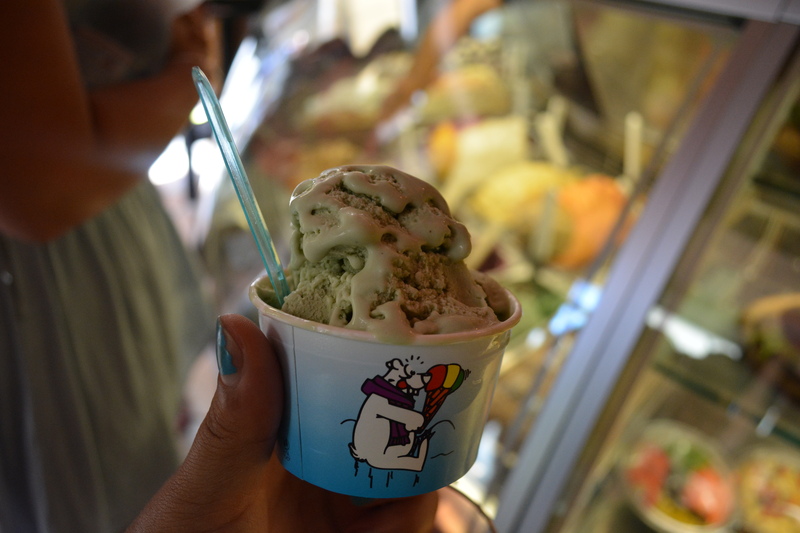 I had a small cup of pistachio-flavored gelato, and though it was essentially the same thing as ice cream, something about eating it in Italy made it exponentially better than ice cream. In fact, I had to stop for another scoop before we hopped back on the coach. Totally worth it. It doesn’t get much better than pistachio gelato. Our free time in the city over, we went back to the campsite with the group to freshen up for our formal group photo. 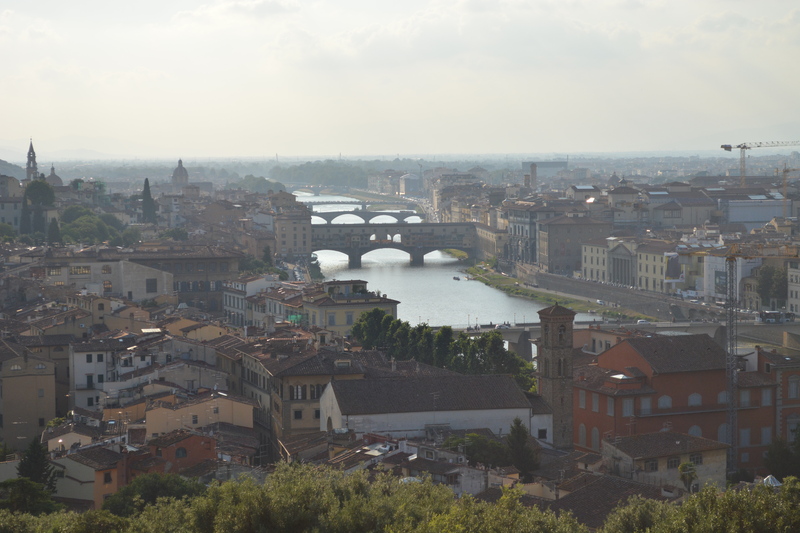 We hopped back on the coach and drove to Piazzale Michelangelo, a small plaza atop a hill overlooking Firenze. With everyone all dolled up and the breathtaking view behind us, we captured a beautiful Contiki group photo (which cost 11 euros, of course) to remember each other and our great time in Florence. 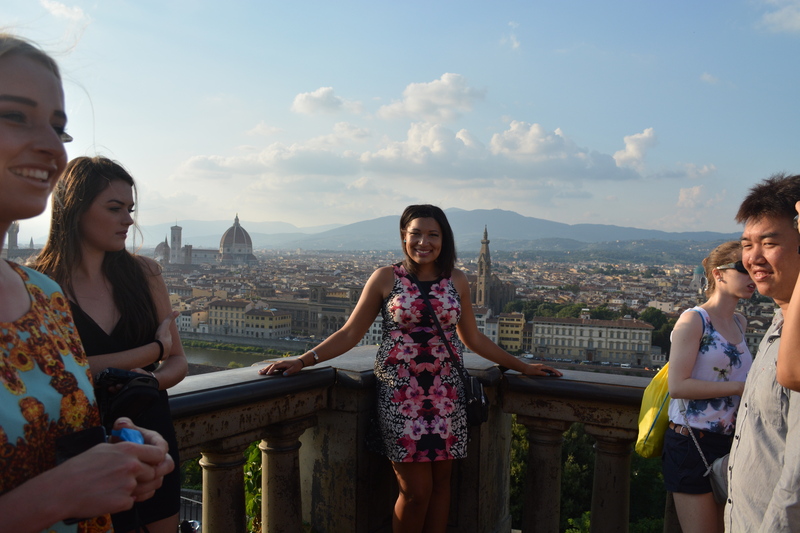 Here’s one of me and the Florentine skyline! Afterward, those of us who has signed up and paid for an optional Tuscan dinner at a fancy Florentine restaurant headed out to get out meal. While the others enjoyed their additional free time, we feasted on bottomless bruschetta, lasagna and salad. Our meal of course was accompanied with authentic Tuscan wine. The food was absolutely amazing, and I could have kept eating the lasagna forever, but I had to save space for the best part — dessert. We were all served fresh, gourmet tiramisu, deliciously coffee-tasting and overflowing with creme. To wash it all down, we were served shots of limoncello, a strong but sweet lemon liquor that apparently helps the body digest. It was possibly the best meal I’ve ever had. Thinking about it makes my mouth water. 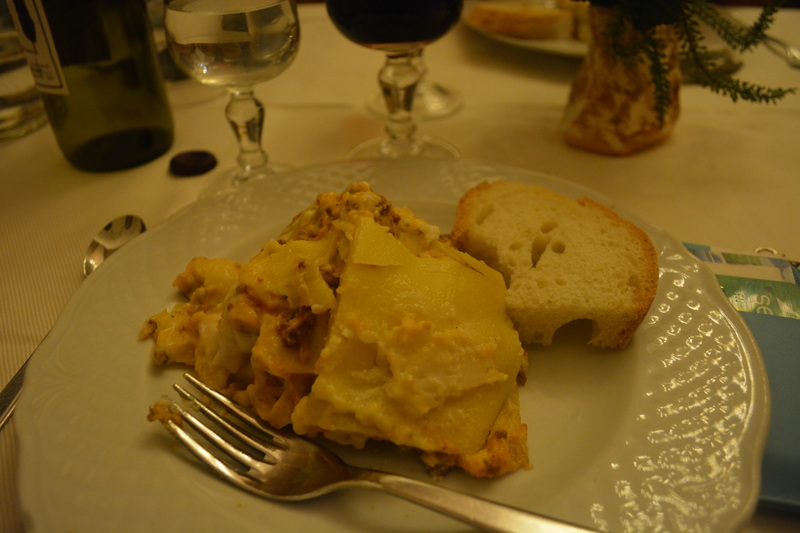 This lasagna was made without tomato sauce! I had signed up and paid to go to a night club with the rest of the group after dinner, but I was still recovering from the karaoke night and decided that I wasn’t ready for a round 2. So I said goodbye to my friends after dinner and headed back to the campsite for a night of much needed rest. I’ll say again that our time in Florence was too short. The city was small, but I know there is so much more to it that I didn’t get to see in the few hours we were there that day. The yellow and brown buildings call to me to come back someday, and I know that I surely will. I truly loved Florence and cannot wait to reunite with it. How can you walk away from this?! im going to florence in a couple days! i loved reading this! Such a beautiful city. Loved it! Isn’t it?! When and for how long were you there?